Please note that due to file size limits of SecretUI this version will no longer be maintained as it will become larger than what SecretUI allows. Please check the above link to go to the download link with more space able to hold the latest versions. All sounds can be disabled and re-enabled individually. See the main installation readme in download for full instructions. ClarettaFX does not alter or overwrite default game files. It simply plays .wav files embedded in the mod .swf files when the GUI detects an event. All sounds I own the copyright or license for having produced, recorded, or bought the rights to the sounds myself. 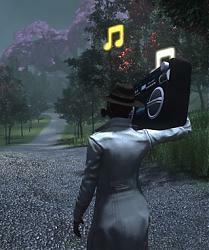 Funcom owns rights to those sounds already in-game which were repackaged for this mod. If using these sounds I strongly recommend setting system volume between 20% - 30% to avoid the sounds distorting. All sounds balanced for TSW default volume sliders (8). Some sounds are louder in order to be audible over combat noise if you're meant to focus on them, such as notification sounds. The Black Signal: John speaks during scenarios, advising you of events in his own special way. Demo video click me Remastered since video was made. Comes with 2 options - with or without the Mysterious Stranger message. See instructions in this sound's subfolder to switch. Sonic Breaching Shot: Receive a sound notification when you receive the Breaching Shot buff. No longer need visual notifications! Demo video click me Remastered to be softer since video was taken. Only small chance to hit duck as in video. Filth Whispers: Filth whispers to you when you step in it. Demo video click me Remastered since video was made. Comes with 3 volume options. See instructions in this sound's subfolder to choose. Buff Calibrations: Receive notifications for losing the Breaching Shot, Deadly Aim and Short Fuse blocker debuffs. Also receive notifications for when you lose your anima consumable buffs. Wilhelm Survivors: Survivors scream in scenarios when killed. As heard in The Black Signal demo video. Wall of Fire: Scorched Earth has a better sound. Demo video click me Remastered since video was made. Has 2 options for with and without the ignition thud. See readme for instructions. Using these sounds will use more memory since they're loaded at game start. However, the footprint is very small (less than the size of the download) so you should not experience any performance impacts if you have enough RAM to play The Secret World in the first place. In addition, you can stop the mod loading sounds on game start by following the instructions in the download. If you do not play scenarios, for example, you can just tell the mod to not load The Black Signal, preventing it from using memory. October 13 2014: Added an alternate version of Wall of Fire to remove ignition sound. See readme for installation options.